Before use VetRx™ should be warmed. Open cap and place the bottle in a pan of warm water. Adults--give 3 drops in each nostril 4 times daily for 3 days. 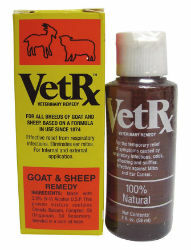 Kids & lambs--give 2 drops in each nostril 3 times daily. Ear mites, coat inside of ear and repeat treatment daily for 3 days. Safe for use in conjunction with any prescribed veterinary medication.